The main building where the dining room/bar is situated. One of the chalets, 2 rooms to a unit. View of the Main Building and 2 of the units overlooking the gardens. Prawn cocktail one of the starters from the restaurant. Our famous z-bone served with our very special pepper sauce. 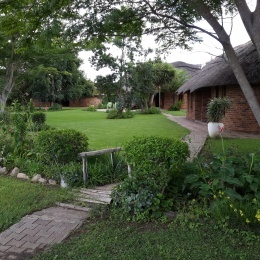 Southern Comfort Lodge built in 1995 offers a very personal service with 6 twin bedded rooms set in a tranquil garden with an abundance of birds. Only 10 minutes from the centre of town yet giving you the feeling of being outside of the City. All the rooms are twin bedded with DSTV, free wifi, tea/coffee facilities and a bathroom en suite. In the main building is the restaurant where breakfast and dinner is served, with friendly staff to see to your every need.